Astrology readings of Mahendra Singh Dhoni horoscope indicate that he was born with Virgo rising in the Ascendant and the planets Jupiter, Saturn and the Moon are occupying the Ascendant (Lagna). The combination of angle (Kentra) and trine (Trikona) lords with lord of eleventh house (the Moon) is exceptionally favorable in terms of astrology readings of his horoscope. And this has made Dhoni extremely successful in financial matters within a very short span of time. Astrology readings of position of Mars, as lord of third and eighth house, in the ninth house of Dhoni horoscope has made him extremely courageous and daring in his attitude. This placement of Mars has given him the courage to decimate any kind of bowling attack, when he is in tune with his basic nature. On the other side, as lord of eighth house, the Mars is also obstructing his fate as per vedic astrology readings. It was the commencement of Rahu Mahadasa from October 2002 which gave a kick start to Dhoni’s career as a cricketer. Astrology readings of Dhoni horoscope indicate that Rahu is placed in eleventh house of horoscope along with Yogakaraka Venus. As lord of second house (wealth and status) and ninth house (luck and fortune) – the conjunction of Venus with Rahu is highly auspicious for all favorable results related to wealth, status, fortune and finance. 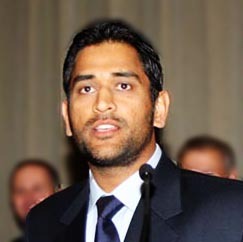 Astrology readings of Rahu mahadasa indicate specific and significant developments in professional and financial matters of Dhoni. During Rahu mahadasa and Rahu antardasa (October 2002 to June 2005) – he was noticed and picked up for Indian A-squad Cricket Team. Astrology readings of Rahu’s conjunction with Venus has blessed Dhoni with strong positive results right from the start; and Dhoni was able to score a century against Assam in the first match of Ranji ODI Trophy in 2003-2004 session. During the antardasa of strong Jupiter in Lagna in Rahu Mahadasa (June 2005 to November 2007) – Dhoni had the golden period of his professional career as a Cricketer. He was not only selected for Indian Test Cricket Team but also crowned with Captaincy of Twenty-20 squad of Indian Cricket Team in September 2007. It is the strong and benefic Jupiter in M S Dhoni Horoscope, which blessed him with stupendous rise in his life and now he is the overall Captain of whole Indian Cricket Team. Astrology readings for Saturn antardasa in Rahu Mahadasa (November 2007 to September 2010) diluted the euphoria a little bit. However, Dhoni was blessed with marriage in Saturn’s antardasa as such the seventh lord Jupiter is conjunct with Saturn. The marriage of Dhoni took place in Rahu/Saturn/Jupiter and all three planets are having their positive aspect over the seventh house. Astrology readings of current antardasa of Mercury in Rahu Mahadasa (September 2010 to April 2013) are not as strong; and during this period Dhoni may not be able to excel as strongly as he used to be. During this antardasa of Mercury in Dhoni Horoscope, we may see him loosing the Captaincy and also making some grievous mistakes of his cricket career. This period is also indicating problem to his parents and they may suffer from some serious health issues. Dhoni may not be able to continue his image of being the coolest Captain of Indian Cricket Team and may get involved in controversies and arguments. Dhoni’s performance as a cricketing Batsman and also as a Captain of Indian Cricket Team is not likely to be good during the coming Cricket World Cup 2011. He must keep his focus and practice his game. The astrology readings of Mercury’s antardasa suggest that he may also face health issues during this period. Astrology remedies can sure help him in this regard. I actually love how it is easy on my eyes and also the information are well written. I am wondering how I can be notified whenever a new post has been made. I have subscribed to your rss feed which ought to do the trick! An impressive share, I just given this onto a colleague who was doing slightly evaluation on this. And he the truth is bought me breakfast as a result of I discovered it for him.. smile. So let me reword that: Thnx for the treat! However yeah Thnkx for spending the time to discuss this, I really feel strongly about it and love studying extra on this topic. If doable, as you develop into expertise, would you mind updating your weblog with extra details? It’s extremely helpful for me. Big thumb up for this blog submit! Yes, the outcome of the current world cup can not be determined merely on the basis of Dhoni’s horoscope. Though, Dhoni’s decisions and performance is not likely to be what it used to be. Guru is a Markesha for Virgo Ascendant and its transit is not completely positive. And, besides Natal Chart, the divisional charts were also analyzed before giving the prediction. and I will also be putting the precisely expected performance of Dhoni and Sachin for the cricket world cup in very recent future. Thanks for your appreciation and kind words Arjun. Venus antardasa, as per my understanding of astrology, is not likely to be good at all. 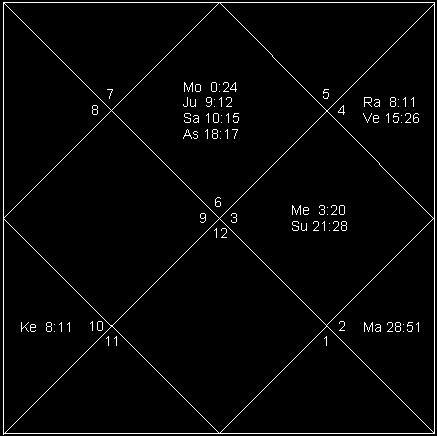 Venus, though conjunct with Rahu in natal chart, has occupied Scorpio Navamsha (the eighth zodiac sign of Kalapurusha). And, in Venus antardasa, we may see end of Dhoni’s cricket career. I deliberately avoided mentioning this as such I wanted to write another article on this. But, since you pointed it out – I felt sharing my views. ok sir. Eagerly awaiting your future articles. saw your predictions on yuvi. Brave attempt on doing single day pred. My grandpa quite knows about astro said you were very right on venus antar for dhoni.Looking forward to your future pred. All the very best for your future endeavours sir. Hello sir and thanks for analysis of Dhoni’s horoscope. In your opinion, how good is India’s chance of winning the world cup? The captain’s chart is very important, more important then the country’s horoscope. It also depends on the transits on the day. Let’s hope for all the best in the world cup from Dhoni and the India cricket team. If only Dhoni’s horoscope is taken into consideration, chances are almost nill. However, it will depend a lot upon the performance of other key players. I have only got accurate birth details of Sachin, Yuvraj and Dhoni. I need to have birth details of some more players. And, also the horoscopes of competing teams are very important. It is matter of who is stronger in comparison to other. Therefore, if competition is strong and planets of indian players are weak; things may not be easy. I think India should qualify quite easily for the quarter final. However,regardless of India’s standing, they will almost definitely play on the 24th March and then either on 29/30 for the semi final and 2nd April for the final. Maybe the fate of his world cup destiny depends on these dates. If you want me to, I can provide you with the horoscopes of the competing countries. India are favourites, followed by South Africa then Sri Lanka. England and Australia have a chance and Pakistan are dark horses. I doubt New Zealand and West Indies will win it but they may upset a big team and go through to the semi finals. 23/06/1928 (first match played) definitely Virgo acs, also has the colour brown for its national team kit. I am postive, yet unsure whether the horoscope of South Africa is the right one, there is one for 1990 and then 1994, but I know another respected astrologer who uses the 1910 horoscope. Thanks Amit for sharing the info. I will surely be finding time to examine and respond over this. Yes, that should be the spirit of every Indian. hello sir! what a wonderful explanation…….i especially liked your honesty in predicting the slim chances of world cup victory.I practice tarot as a hobby ,and i did a reading for dhoni some months ago…..according to my reading his marriage will be problematic and he might have a divorce in his future….but a friend of mine did some analysis based on sun signs of Dhoni and his wife,according to him they are soul mates, if u could spare some time i would be delighted to know your views on it by vedic astrology.thank you,i have become your fan by the time i reached this article,hope to see some of your prediction on political weather of India. hello sir! what a wonderful explanation…….i especially liked your honesty in predicting the slim chances of world cup victory.I practice tarot as a hobby,and my tarot reading for Indian team also told negative results ,and i did a reading for dhoni some months ago…..according to my reading his marriage will be problematic and he might have a divorce in his future….but a friend of mine did some analysis based on sun signs of Dhoni and his wife,according to him they are soul mates, if u could spare some time i would be delighted to know your views on it by vedic astrology.thank you,i have become your fan by the time i reached this article,hope to see some of your prediction on political weather of India. Although Dhoni’s horoscope looks bleak ahead of the world cup, the fortunes of the Indian cricket team depends of the horoscopes of other key players. India’s fortunes also depends of the horoscopes of other countries and capatains. In my opinion, Sri Lanka and Australia have the best chance of winning followed by India, South Africa, Pakistan and England. The horoscopes of the countries I given you are correct. Yes, Dear Amit. We must not conclude the outcome of the cricket world cup, mere on the basis of Dhoni’s horoscope. And, that is why, I have mentioned it specifically that it is the Dhoni’s expected performance. Winning, quite often, also depends upon the strength of the rival. Hence, comparative analysis of the horoscopes of all Cricket Captains is must to conclude something meaningful. In my opinion, the match between England and India is going to be very important and eventful in the light of forthcoming matches. And, if Indian manages to win that very match, there are strong chances that England may not qualify even for quarter final. However, if India lose against England, than Bangladesh may again obstruct the path of Indian Cricket Team. The first two games will be very interesting. India will look to play an improving Bangladesh and a determined England. The other games I am looking forward to is against South Africa who are looking to win their first world cup and against a depleted West Indies. Bangladesh may have a chance to go far, since they beat New Zealand, India and South Africa in the last world cup and have recorded wins against New Zealand and Australia. I agree that the first two games are very important for India. The main cause of concern is the comparative strength of England and Indian horoscopes on 27 February 2011. The horoscope of England, taken along with the transit movement on 27 February 2011, is reasonably more strong than India. And, on that very day, the performance of Dhoni is also not likely to be upto the mark. Therefore, I suspect, India may loose this match. And, if Bangladesh manages to beat England. And, if the two teams are having equal points for consideration of top four quarter finalist, it will be this match of India Vs. England that can make the difference. My husband and i felt lucky Chris managed to finish off his investigation while using the precious recommendations he obtained from your own web site. It is now and again perplexing to simply be handing out helpful hints that other folks may have been making money from. So we consider we have got the website owner to give thanks to for that. The specific illustrations you have made, the easy blog navigation, the friendships your site help to instill – it is all wonderful, and it’s really helping our son in addition to our family know that the issue is satisfying, which is tremendously important. Many thanks for all the pieces! Have you ever thought about including a little bit more than just your articles? I mean, what you say is valuable and all. Nevertheless imagine if you added some great pictures or video clips to give your posts more, “pop”! Your content is excellent but with pics and clips, this blog could definitely be one of the greatest in its niche. Good blog!